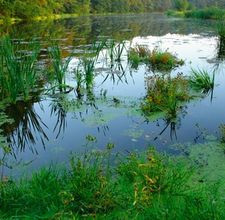 Microorganisms play pivotal functions in nature, particularly within aquatic ecosystems. Whether in an ocean or a lake, they are key players in the food chain and the vitality of individual ecosystems. A team of researchers led by Arezoo M. Ardekani, the Rev. John Cardinal O’Hara, C.S.C., Assistant Professor of Aerospace and Mechanical Engineering at the University of Notre Dame, has shown that density stratification, a frequent feature of aquatic environments, has important ecological consequences on these small organisms. The team recently published a paper in the Proceedings of the National Academy of Sciences that demonstrates that density variations encountered by organisms at pycnoclines, regions of sharp vertical variation in fluid density, have a major effect on the flow field, energy expenditure and nutrient uptake of small organisms. Organisms at pycnoclines afford a competitive advantage due to smaller risk of predation. These results, which were part of a National Science Foundation supported project, can be used to explain why an accumulation of organisms and particles, which leads to a wide range of environmental and oceanographic processes, is associated with pycnoclines. Ardekani joined the University in 2011. Her research interests focus on the fundamental properties of multiphase flows of Newtonian and non-Newtonian fluids relevant to biofluids, and micro/nanofluids for use in biomimetic applications, biomedical devices, alternative energy technologies and environmental remediation. Most recently, she was awarded a 2012 National Science Foundation Faculty Early Career Development Award for her work in fluid dynamics of bacterial aggregation and formation of biofilm streamers. Prior to joining the University, Ardekani served as a Shapiro Postdoctoral Fellow at the Massachusetts Institute of Technology and is currently a member of the American Association for the Advancement of Science, American Chemical Society, American Physical Society, American Society of Mechanical Engineers and Society of Rheology. 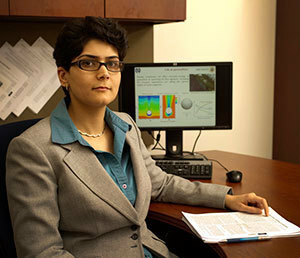 She received her doctorate (2009) and master’s (2005) in mechanical and aerospace engineering from the University of California at Irvine and her bachelor’s in mechanical engineering from the Sharif University of Technology in Iran (2003). Originally published by William G. Gilroy at newsinfo.nd.edu on March 06, 2012.